Karabakh negotiations. What happened in Moscow? High level talks on Karabakh conflict resolution concluded on July 17th and July 18th in Moscow. Armenian and Azerbaijani sides didn’t comment much. The OSCE Minsk group mediators sounded disappointed, even if they tried to accurately conceal that with phrases like “very open discussion took place” and “there was no progress, but there was not step back either”. It seems like the reason for failure in progress was Armenia’s stance. There was a serious backlash in Armenia following the release of Madrid principles by the Presidents of OSCE Minsk group co-chairing countries at the G8 meeting in Italy. Calls demanding resignation of Foreign Minister Eduard Nalbandian and reversal of policy on Karabakh by ARF-Dashnaktsutyuniun, criticism from Karabakh Ministry of Foreign Affairs, were followed by Nalbandian’s statement, which made clear, that there is hardly any point in the upcoming negotiations in Moscow. Interestingly, it seemed from the side, that much of this halabaloo on the Armenian side was carefully staged by the authorities ahead of the negotiations. It seems there was pressure on them and they needed this backlash to adopt a more hardline stance. The question than remains – why all this circus? Why don’t they just say – we don’t need no negotiations? “Armenia and Turkey have agreed on a comprehensive framework for the normalization of their bilateral relations,” is said in the joint statement disseminated by the Armenian and Turkish foreign ministries. Hot discussions around the statement have started in the Armenian blogs. “Today, a day before the commemoration of the genocide victims, we have learnt that Armenia and Turkey had signed an official joint document on normalizing bilateral relations and identifying a road-map,” Ogostos writes. “I would like to a) know what that bloody road-map contains; b) hear what Dashnaks will say before their torchlight procession; c) read “Golos Armenii” and other similar newspapers. Actually, I would like normal relations to be established between Armenia and Turkey. However, I am concerned about the price we will have to pay for it,” Ogostos concludes. Iran does not have too many friends these days, but in a far corner of the Caucasus, on the edge of Europe, it is forming a special relationship. Omid has also just opened a Persian restaurant, catering for locals as well as Iranian expats, keen for some home cuisine. Part of that freedom includes an increasingly liberalised economy, and that makes Armenia attractive to foreign investment. The Armenian capital is hardly an international economic powerhouse, but there are signs that Iranian investors sense an opportunity. Interestingly, The Armenian Economist has covered the unsatisfactory level of trade turnover between Armenia and Iran, given the huge potential. The story also explores US discontent with warm Armenia-Iran relations, and explains the situation of blockade the country is in. PS: My special thanks to Patrik for always sending very interesting info and links to my email address. Duly appreciated! 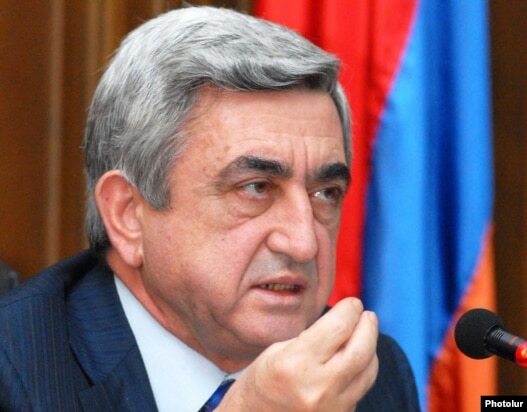 President Serzh Sargsyan is forming a new government following the April 9 inauguration ceremony held behind the police wall, that separated him from the citizens of the country, which he will try to rule, following disputed elections on February 19th, which resulted in violent clashes between opposition supporters and security forces. Following the appointment of Prime Minister Tigran Sargsyan, President Sargsyan held consultations with representatives of the 4 party coalition, and today two key ministerial appointments were announced. The current ambassador to France Eduard Nalbandian, a career diplomat who also served as the country’s ambassador to Israel, Andorra and the Vatican, will replace Vardan Oskanian on the post of foreign minister, AFP reports. President Sargsyan has also appointed the chief of Armenia’s armed forces, Seiran Oganian, as the country’s new defence minister, according to presidential website news bulletin.